all premium and freemium courses. 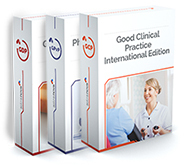 The Good Laboratory Practice (GLP) online course focuses on the international Good Laboratory Practice guidelines. It provides full overview of the standards and requirements of regulatory authorities in regards to non-clinical studies. By taking our online training, professionals will be able to improve their theoretical and practical understanding of the GLP standards and to obtain a GLP certificate upon successful completion of the online exam. GLP generally refers to a system of management controls for laboratories and research organisations to ensure the consistency and reliability of results as outlined in the OECD Principles of GLP and other national regulations. The GLP training is required for personnel involved in non-clinical studies, in order for them to be able to follow instructions and important measures. This training is also available as a corporate solution, which includes an administrative panel through which an appointed person, such as the HR Manager, can select who does the training when, as well as monitoring tools and access to statistics. The GLP training is also offered in the form of face-to-face training, where experts from our International Network of Trainers come to you; additional content customisations are available upon request. Join Astra Nova now and obtain immediate access to all free courses provided by the Better Industry Initiative.